I'm finally getting back to my sewing room after our short vacay to spoil the grandkids. I always have ideas bouncing around in my head - even on vacation - so now I have even more projects to add to my to-do list. 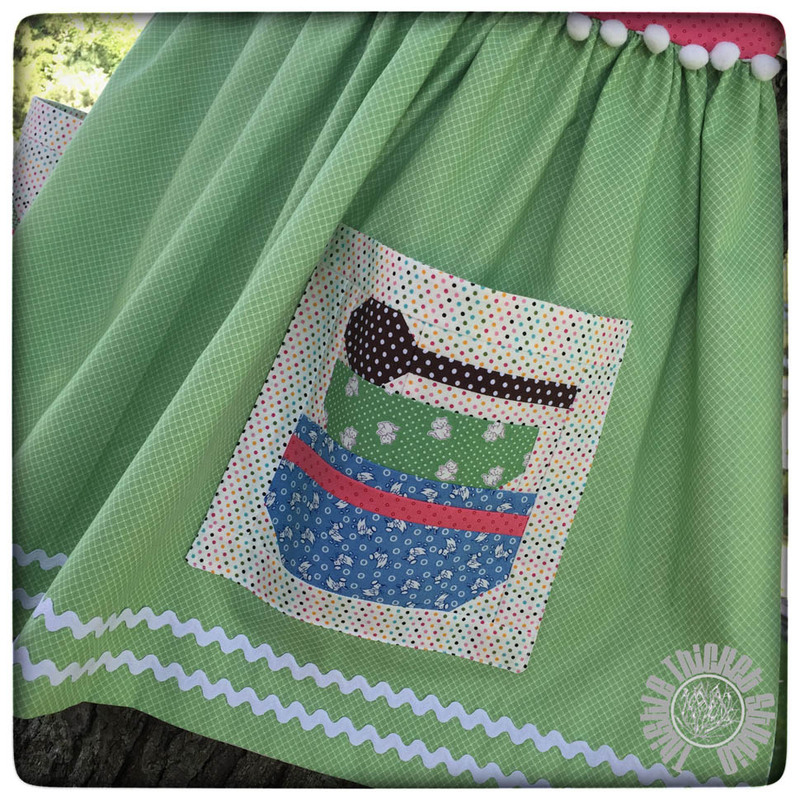 But first, I wanted to finish up a project I started from the Farm Girl Vintage Sew Along. I made a 6" Baking Day block to use as a pocket for an apron but the other blocks didn't fit the baking theme for me. 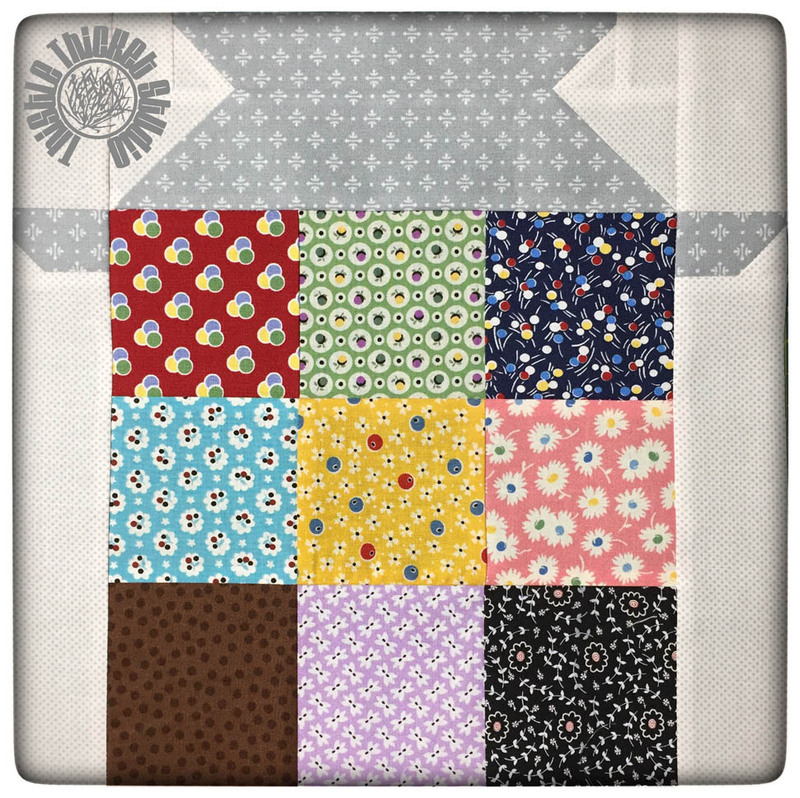 So, this week I played with designs for a hand mixer block for the second pocket and finally finished my apron! Set the apron aside. Next, fold the apron strings along the length with right sides together. 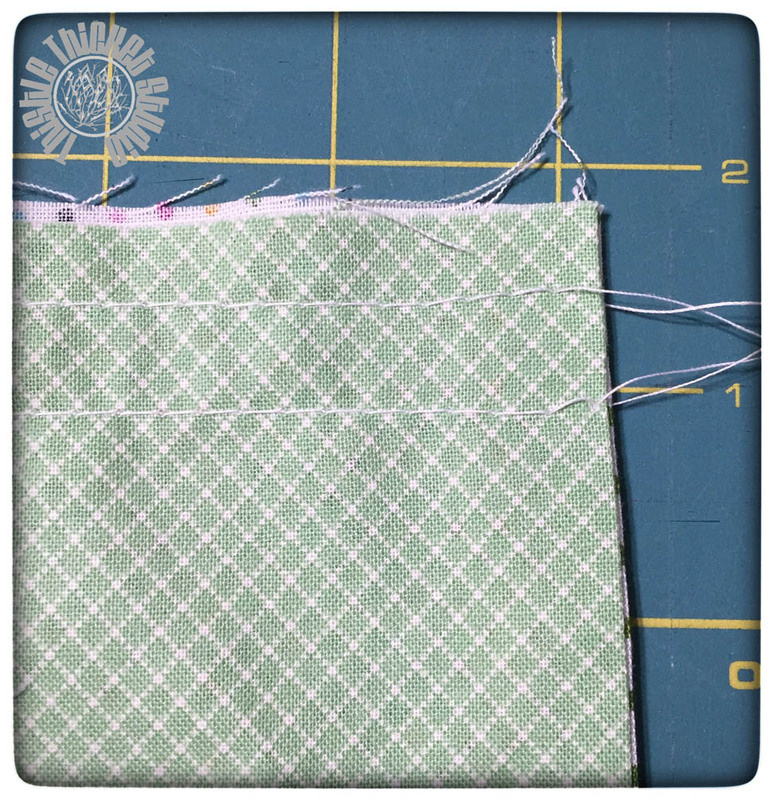 Sew across one short end and down the length of the strip. Clip the two sewn corners and turn right side out. Press. Repeat for the other string. Place a small fold, approximately 1/2" in the unsewn end of both apron strings and stitch in place. 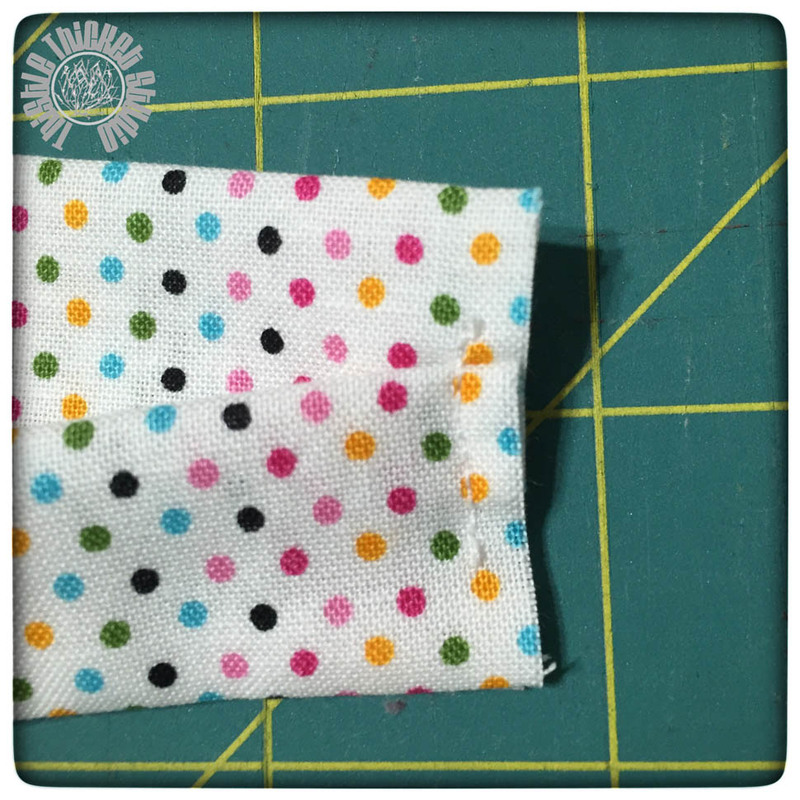 Stitch the end using a 1/2" seam. Repeat for the other side. 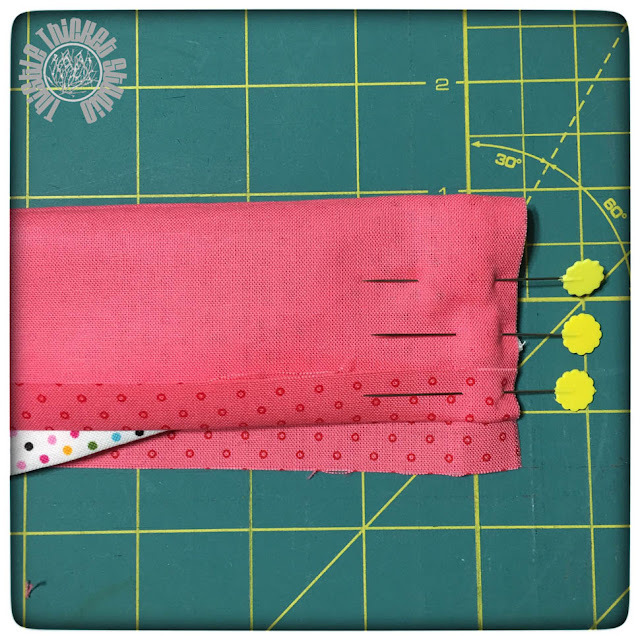 Turn the waistband right side out. Measure the length of the finished waistband and gather the apron front to the same length. 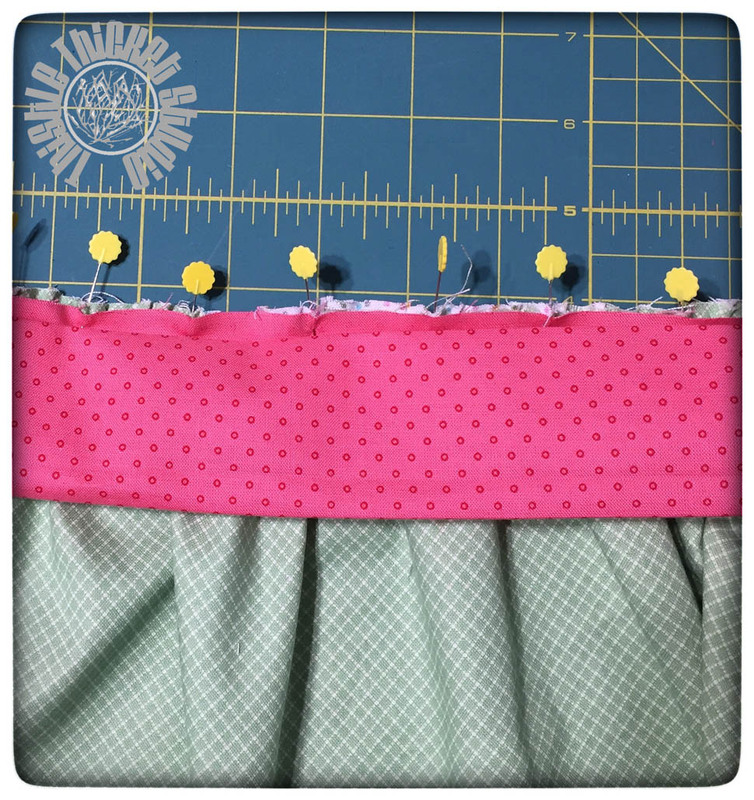 Pin the apron front (right sides together) to the side of the waistband that is not folded. 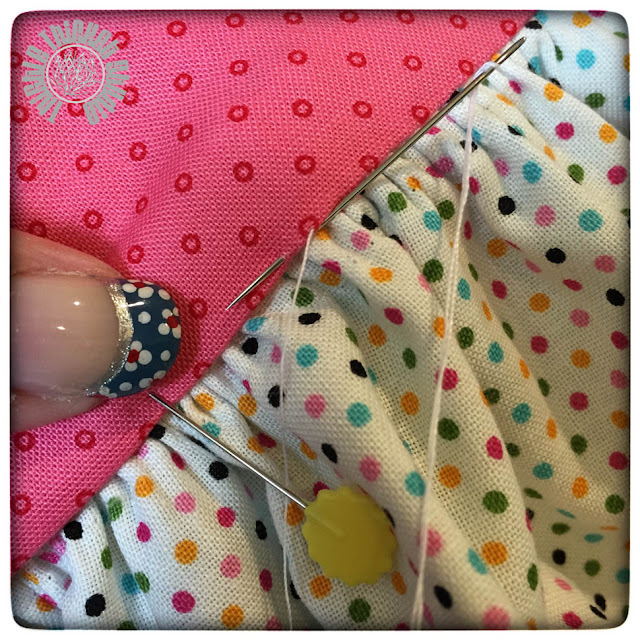 Sew the waistband to the apron using a 1/2" seam. Fold waistband over raw edges and hand-sew the folded edge of the waistband to the apron lining along the seam line. Ta-Da! 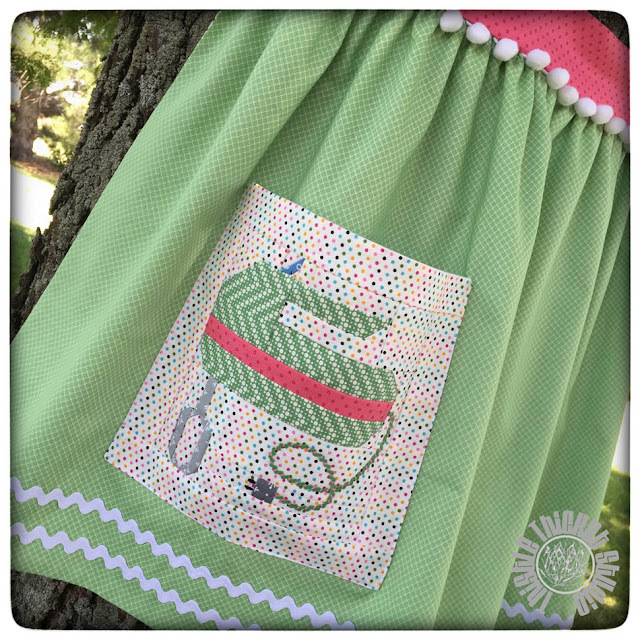 One apron perfect for any farm - or city- girl! 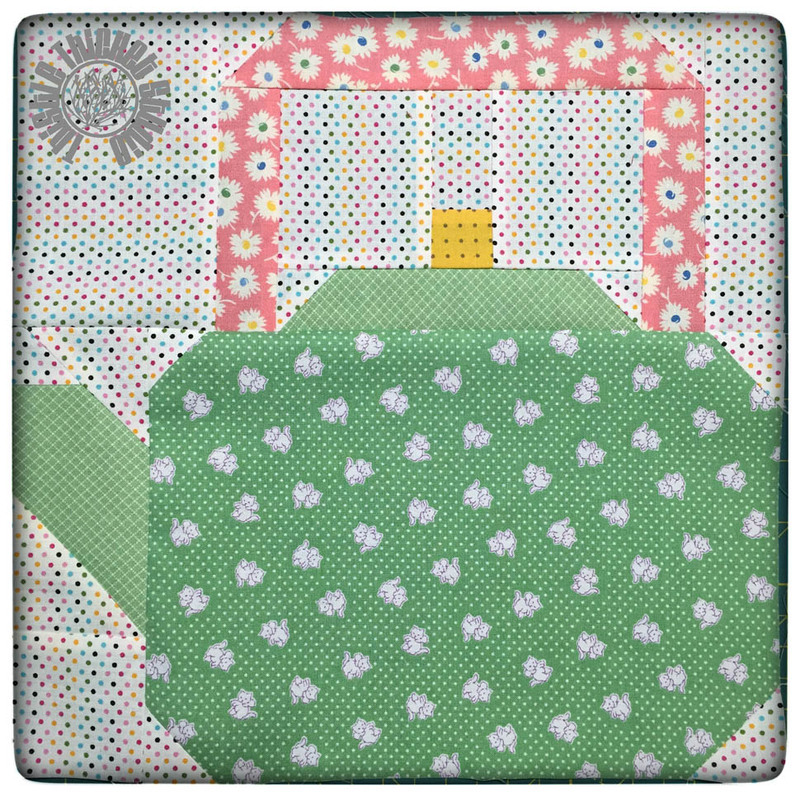 Isn't the Baking Day block so cute! I love how the bright pink waistband picks up the touches of pink in the pockets. I love how my Hand Mixer block turned out. 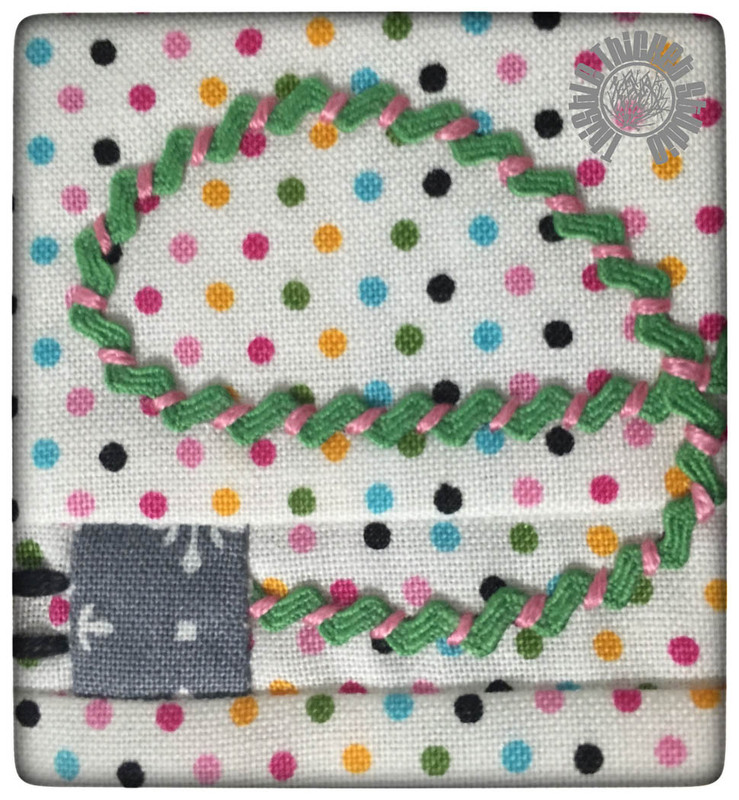 The electrical cord is green rick rack sewn down with pink embroidery floss. Now, I have to confess. I'll probably never wear this apron, but it will look so cute hanging in my kitchen. I know this post is long, but I wanted to share a couple of other things new this week. 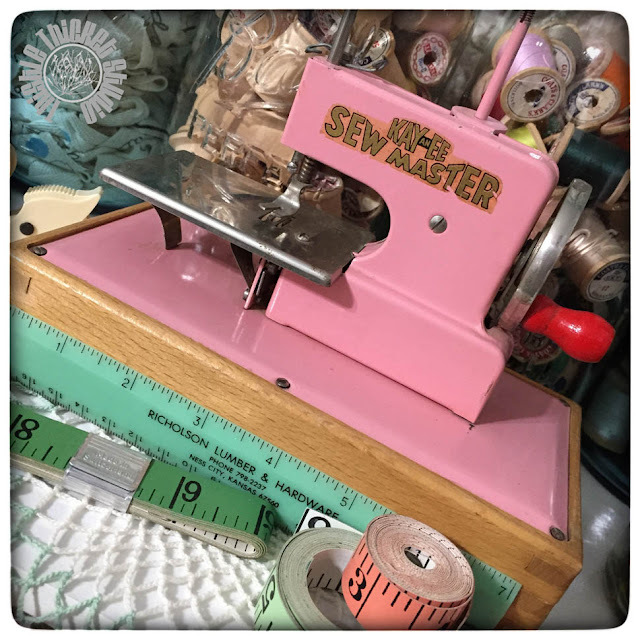 I wanted to share my latest junking find - a pink toy sewing machine! I was excited because I didn't have a pink one in my collection and I got it for a steal. It now sits on a pink and green crocheted doily on top of my cube cubby that holds all my scraps. Did you notice this new link in the sidebar? I'm excited to share that I've been invited to design a block for Fabri-Quilt's upcoming New Block Blog Hop to be held the week of August 31st! I've been playing with ideas, but haven't gotten that 'brainstorm' yet. Wish me luck! We'll be using Fabri-Quilt's Prairie Cloth Cotton Solids in the Watermelon Summer Color Palette of chartreuse, turquoise, coral, aqua, lapis blue, and white. Pretty colors! 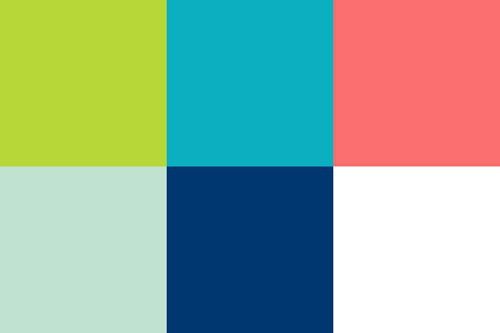 Help me out with inspiration...leave a comment on what these colors make you think of. Thanks in advance! With harvest complete, the hubby and I took the opportunity to head to Texas for a few days to spoil the grandbabies last week. 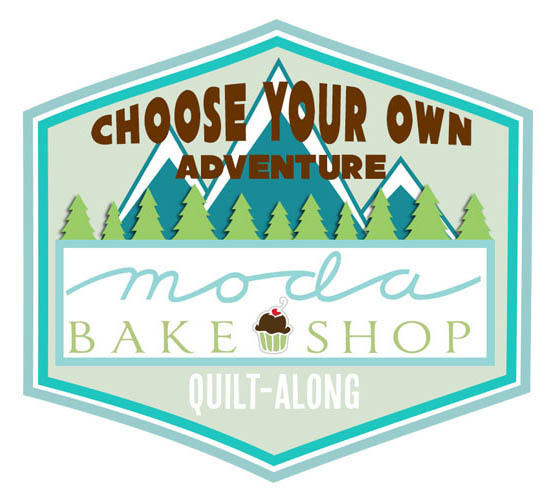 And no road trip would be complete without stopping at a few antique shops and quilt shops! Much to my hubby's delight, I didn't make any large purchases, but did pick up a couple of fun things for my sewing studio. Uh-oh! Don't they say three or more of anything is a collection? Well, I think I started a new collection - vintage needle book cases! I found these at the Austin City-Wide Garage Sale and couldn't resist. Now I just have to figure out how to display them. 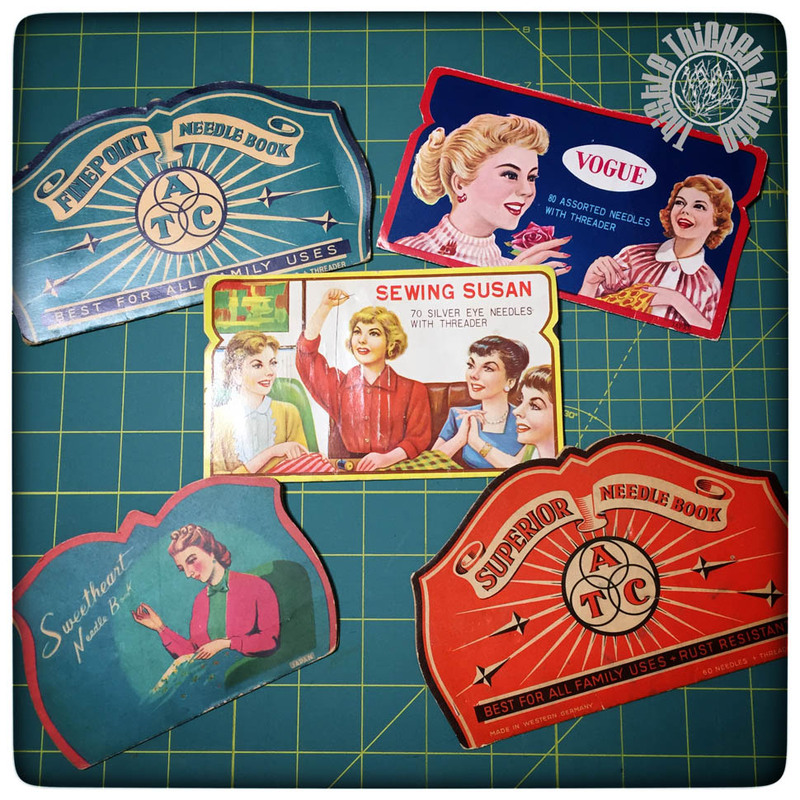 Do you collect vintage needle book cases? How do you display them? I found this cute little metal green and yellow toy wheelbarrow at a shop in Taylor, Texas called Cherry Tree Creative. This really cute shop features antiques and upcycled things made by local artisans. It's connected to another cute shop with lots of vintage décor items called The Nest Box. Again, I couldn't resist the wheelbarrow - especially since it was in 'my' color of green! 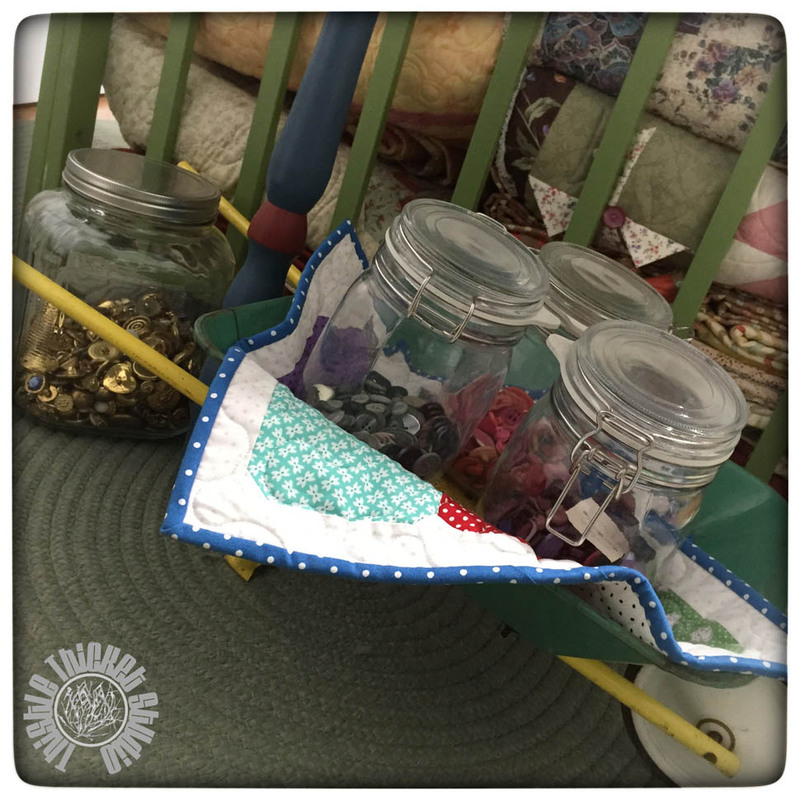 I filled the wheelbarrow with some of my button jars and one of my Farm Girl Vintage canning jar block table toppers and it now sits by my vintage green baby crib filled with quilts. Of course I had to shop at a quilt shop - or two or three. I picked up some Row by Row patterns and a few new pieces of fabric to add to my stash for the Farm Girl Vintage Sew Along. 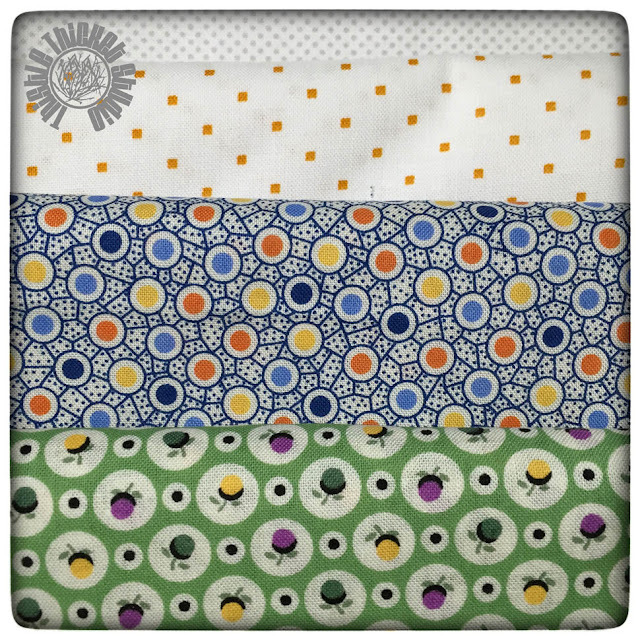 I found a couple of other cute goodies that I can't share yet or it would spoil the surprise for some quilty friends. 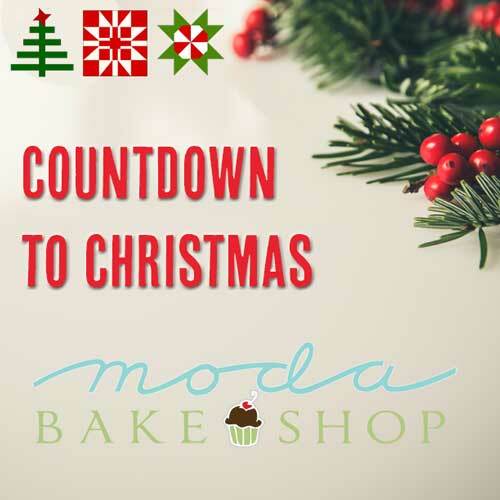 Hopefully, you'll keep stopping by and see them later! 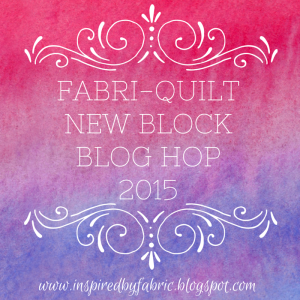 Then hop on over to the 2015 New Quilt Bloggers Hive Hosts' pages to see how to enter for some great prizes! OMG! 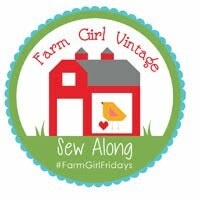 Can you believe this week marks the half way point of the Farm Girl Vintage Sew Along!!! 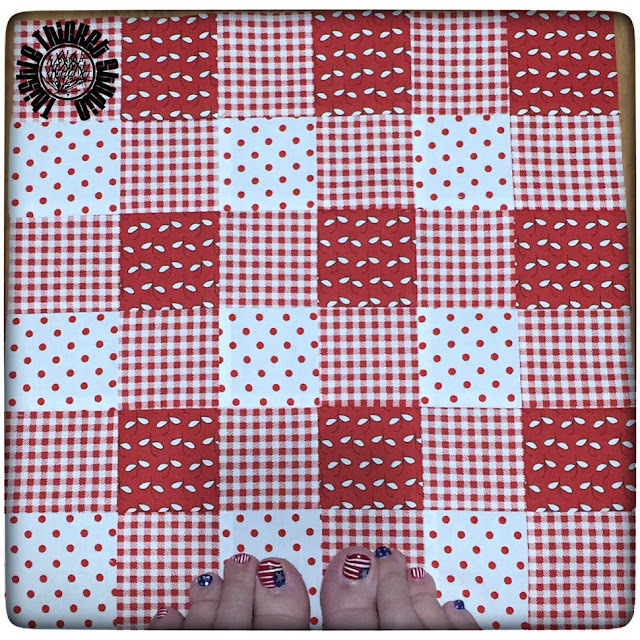 This sew along has been so fun, the time has just flown by. 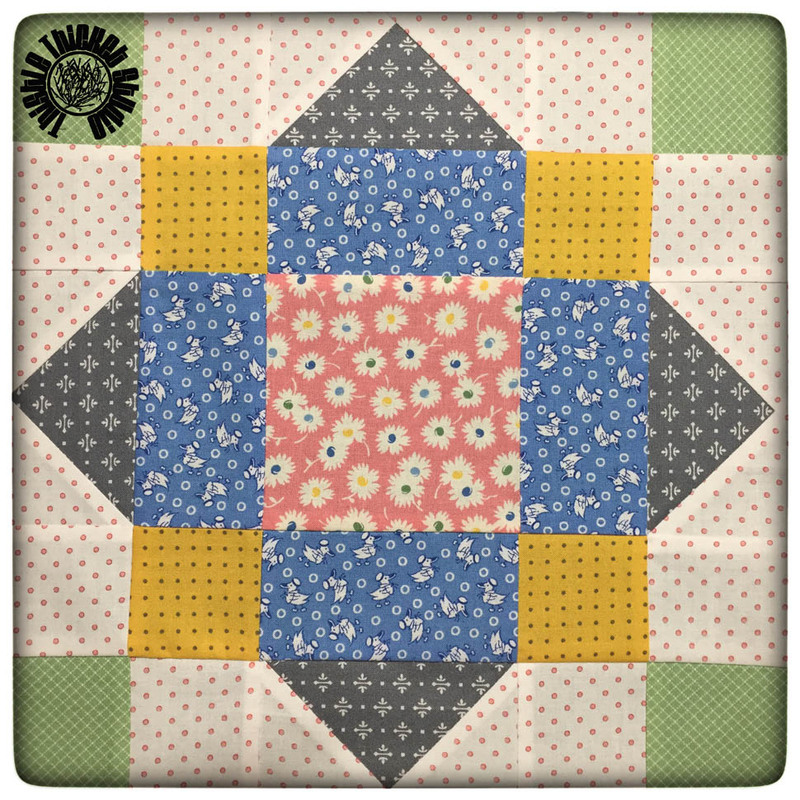 I really have enjoyed all of the extra projects Lori Holt of a Bee In My Bonnet has shared each week along with her blocks. 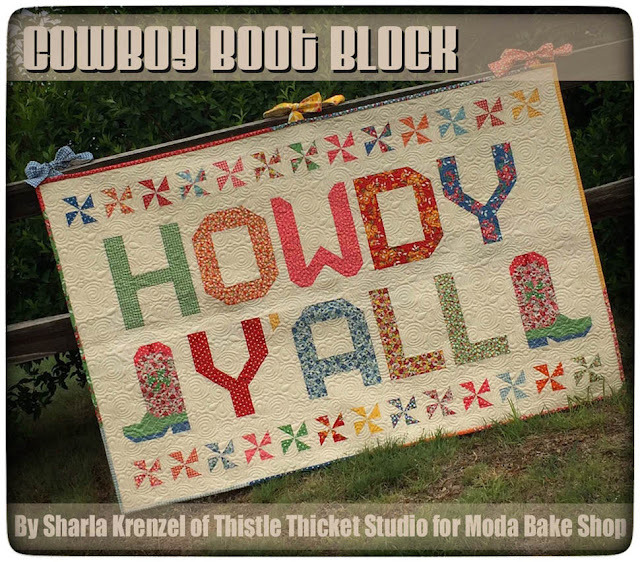 I follow Lori on Instagram @beelori1 and she has been posting pictures of the cutest extra blocks and projects she designed for her Farm Girl Vintage retreats. 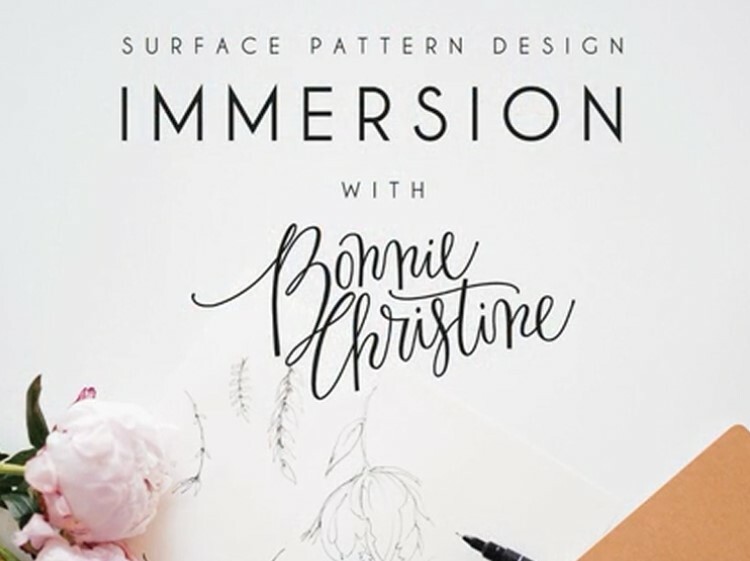 Can't wait until she shares the patterns! 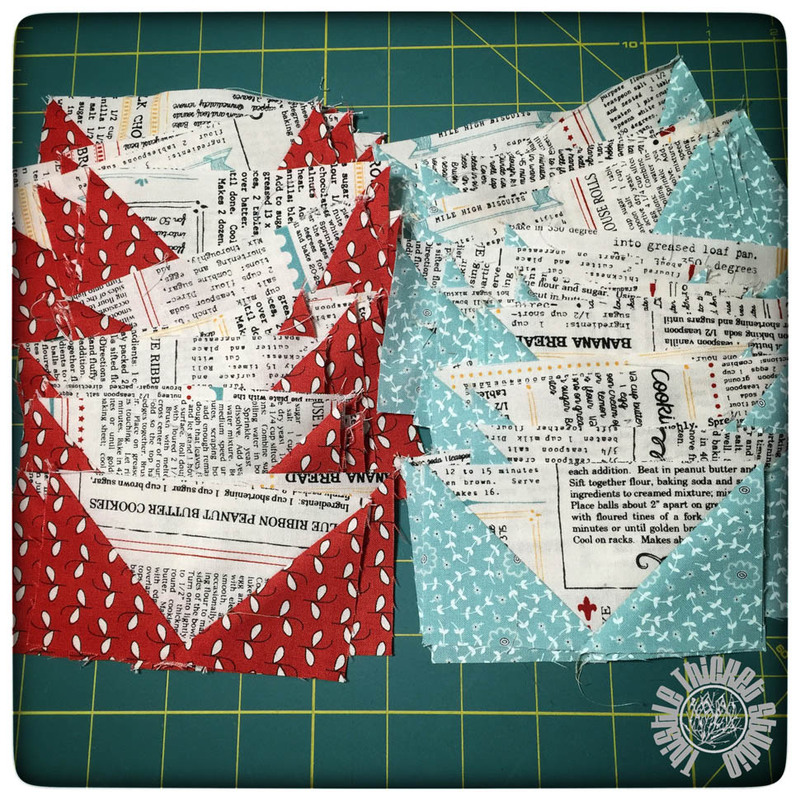 Speaking of sharing, I thought I'd share another sneak peek at the extra project I'm working on for my turn on the Farm Girl Vintage Sew Along blog hop. 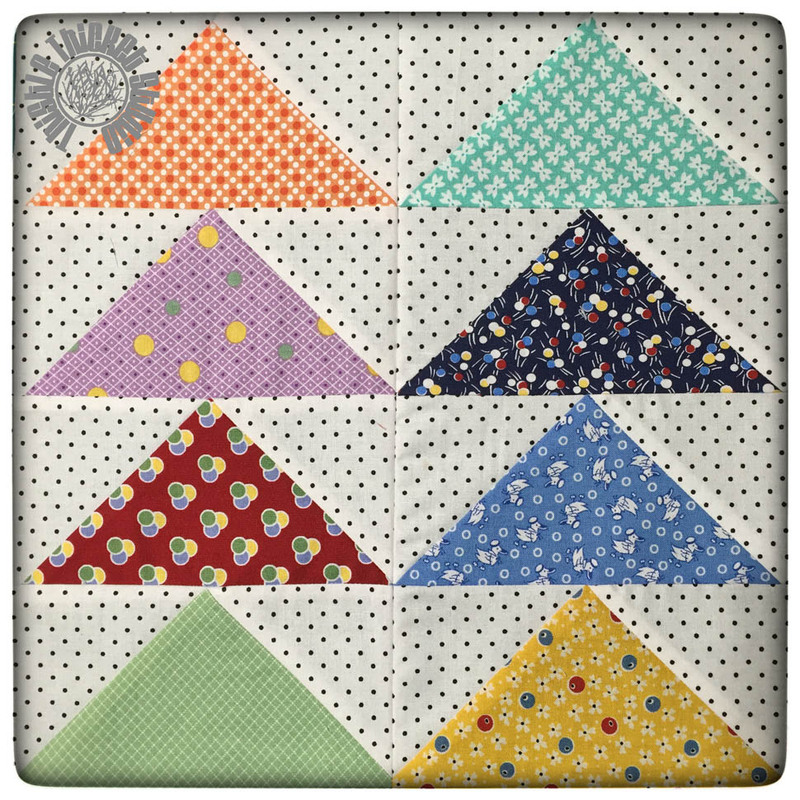 Lots of flying geese using Feed Company by Sweetwater for Moda! I better get crackin'! 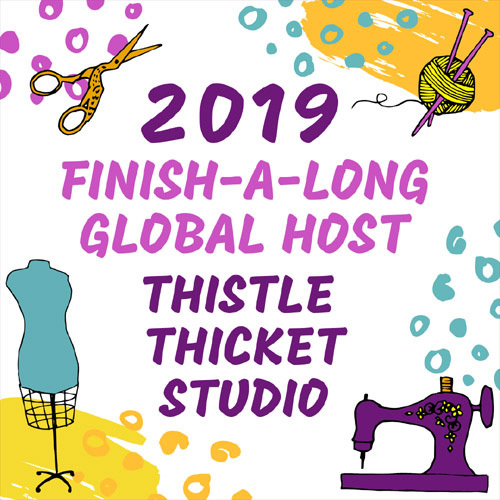 There's only 10 more weeks until my turn on the Farm Girl Vintage Sew Along, and I've got a long ways to go before my extra project is done! 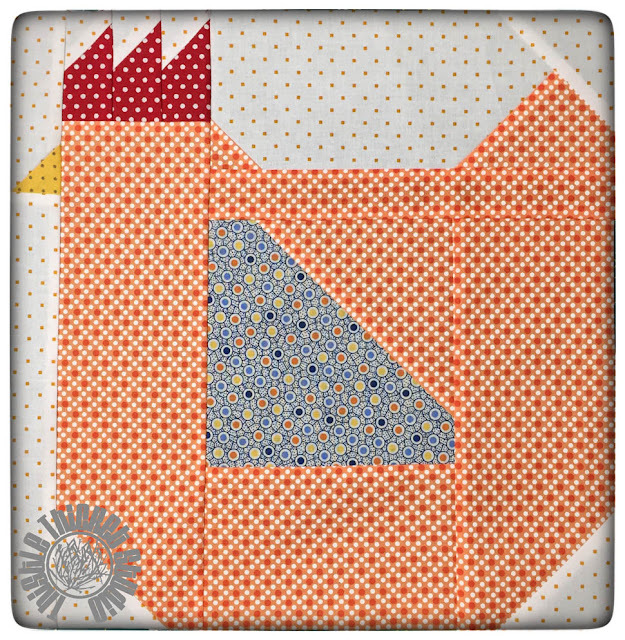 What extra projects are you making from the Farm Girl Vintage book? Since the Farm Girl Vintage Sew Along blocks were so quick and easy this week, I had a little time to play. Decisions, Decisions. The hard part was deciding what to play with! In the end, I decided to make a couple of necklaces for my daughter using my vintage typewriter keys. Making them was simple and quick. 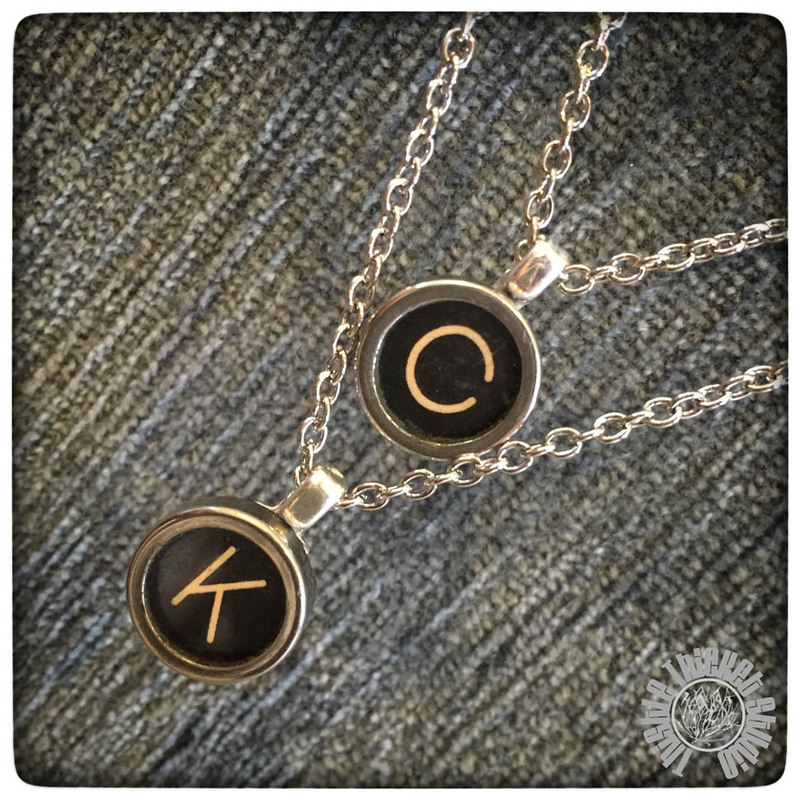 A little chain, a couple of bails, a clasp, and some jewelry glue turned two typewriter keys into a double necklace sporting my grandsons' initials. The most difficult part was waiting for the glue to dry! 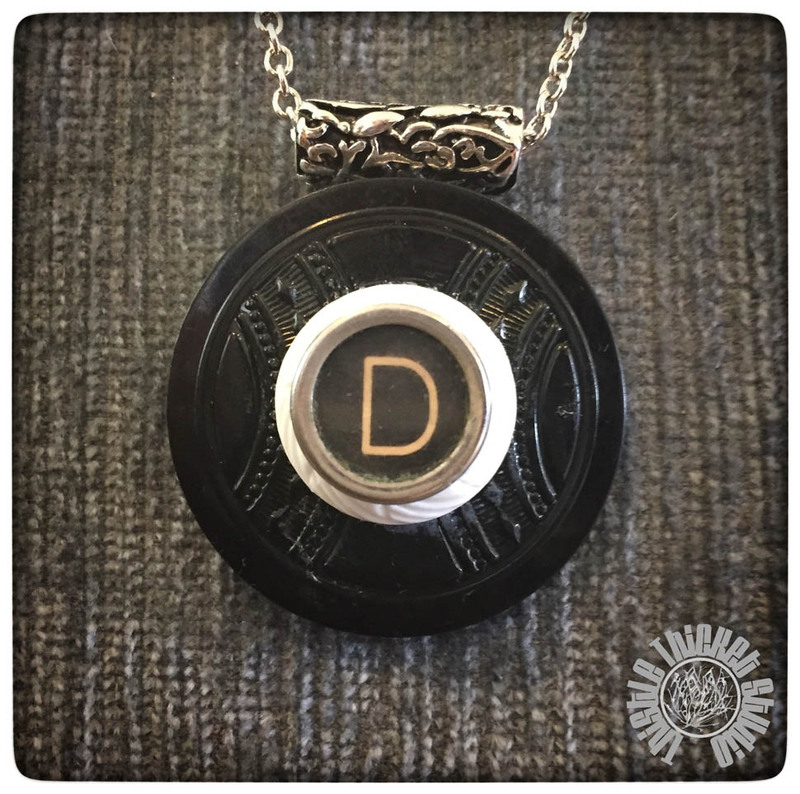 Next, I decided to stack a couple of vintage buttons and top it with another typewriter key sporting my daughter's initial. I hope she likes them! And just because I had all the supplies out, I decided to make one more for fun. This one isn't claimed, so if you're interested, email me and we'll negotiate a price:) Doesn't everyone need a "Shift" necklace? Lol! It'll add a little quirky fun to your wardrobe (wink, wink). Then, guess what?! My brother-in-law found, not one, but TWO old typewriters at the county dump and rescued them for me! How awesome is he?!!! 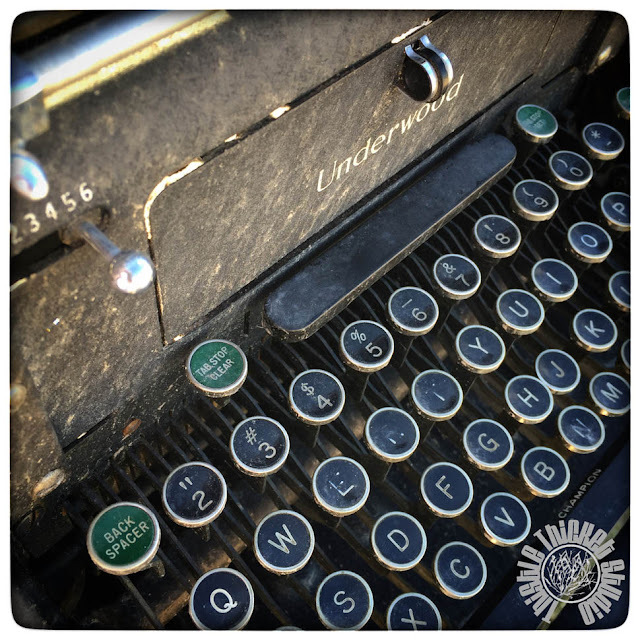 Who else loves old typewriter keys? What do you do with them? Share your ideas & DIY projects in the comments! After whipping out a couple of quick Farm Girl Vintage Sew Along blocks this week, I was excited to tackle a new upcycle DIY project. 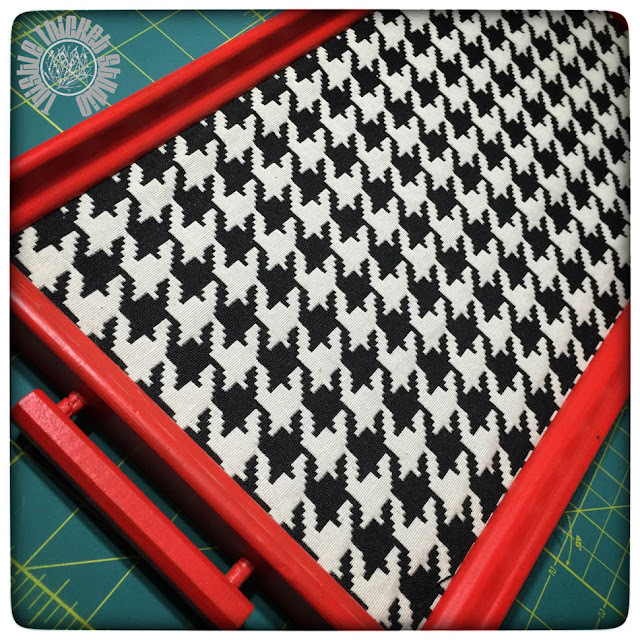 I found this rather dirty wood tray with a fabric insert on my last junking foray and thought it would be perfect to transform with yardsticks for my sewing studio. I removed the fabric center of the tray and repainted the wood frame in my favorite jadeite green color. Then I cut an assortment of painted yardsticks to fit into the wood frame, glued them and then nailed glacier points to hold them securely. TaDa! Perfect to hold an assortment of sewing notions or block pieces beside my sewing machine. I love it! I like to think of this as my Grandma and Grandpa B's block because they used to raise all sorts of chickens, pheasants and other birds, and they grew a huge vegetable garden with lots of flowers (the snapdragons were my favorites!). So I added flowers and birds in this block for them. 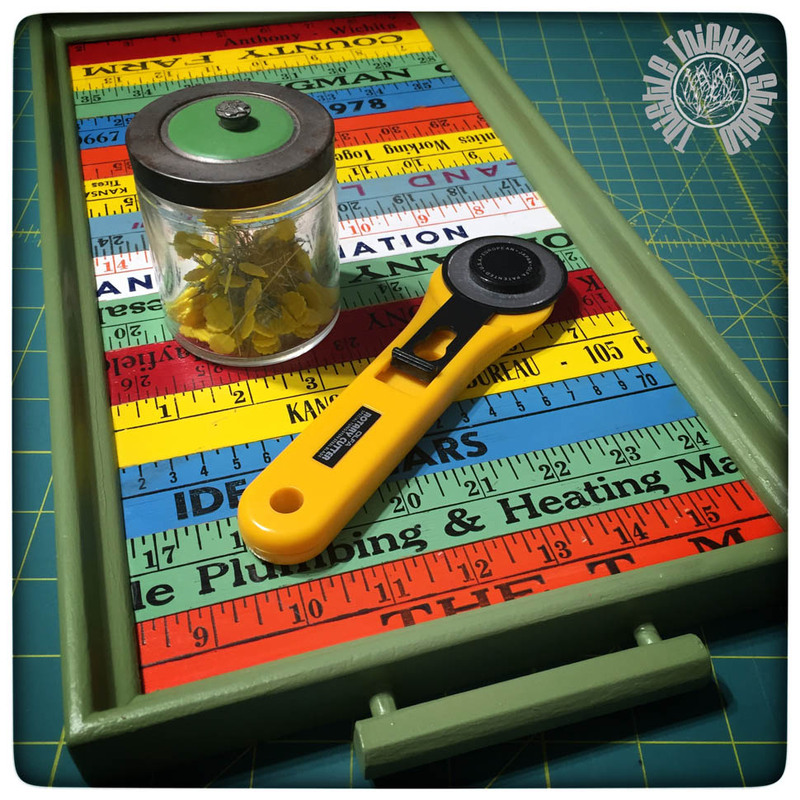 Stop back by in a few days and I'll share some more DIY upcycled projects I've been working on. Can you believe it is already Week 10 of the Farm Girl Vintage Sew Along? Where did May and June go?! 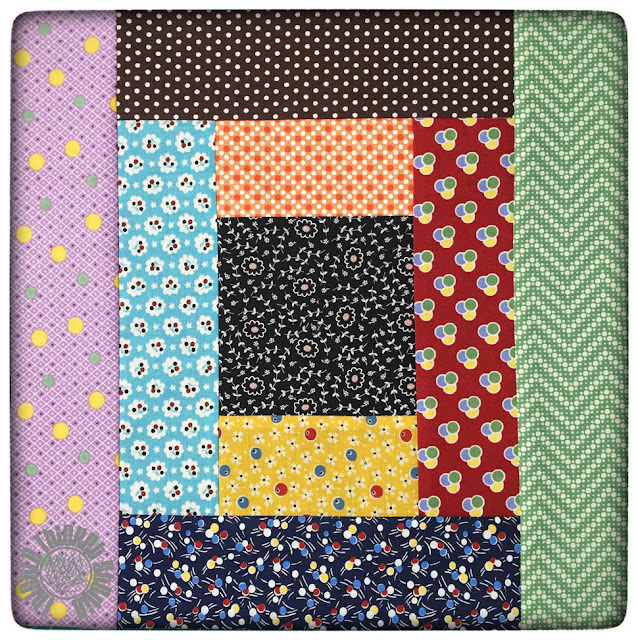 Even though we are 10 weeks in, its still not too late to join Lori Holt's (Bee In My Bonnet) sew along. You can get all the details here. 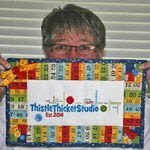 There are lots of quilters blogging about this sew along, but there are 45 that have been selected to be a featured blogger for each of the 45 blocks in this project. I'll be the featured blogger in September for the Water Turn Block. 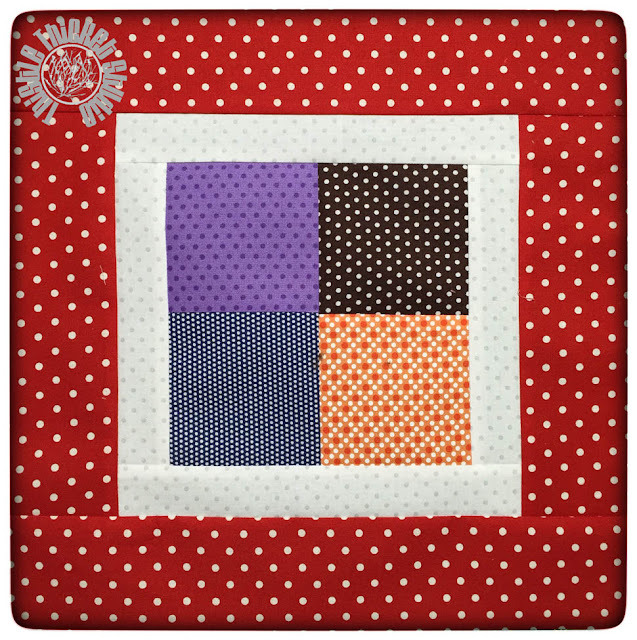 You can see the list of bloggers and their links at the Fat Quarter Shop here. Making these blocks was how I enjoyed my 4th of July afternoon! Ah, the freedom to sew (& paint your toes red, white & blue too)! I hope you enjoyed a little sewing sometime during this holiday weekend too! 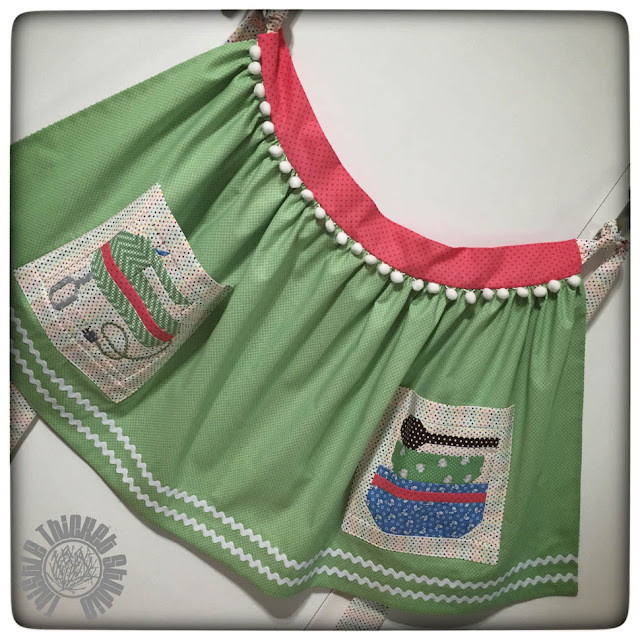 Featherweights, Pincushions & Necklaces - Oh My! I am over-the-moon excited!!! Look what my mom found for me!!! (Is that a sufficient number of exclamation marks to express my level of excitement?) While I spent the last week on a combine in wheat harvest, my mom was spending the week with her siblings doing what they enjoy - antiquing and playing cards. 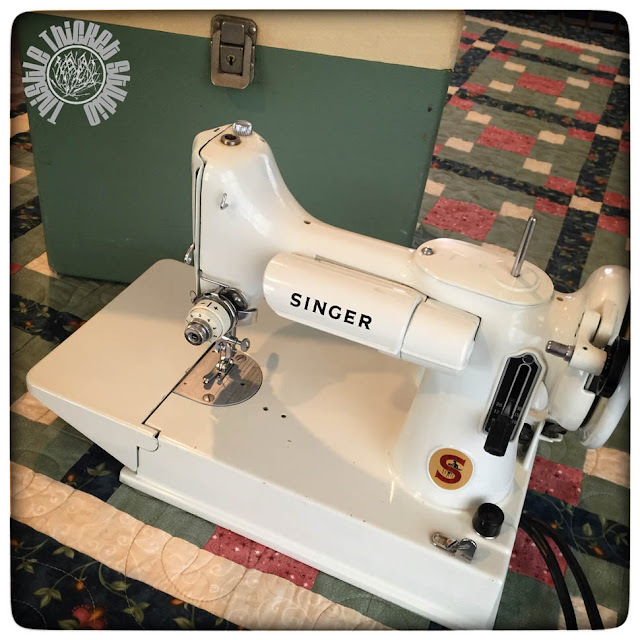 And she found me this awesome white 1964 Singer Featherweight 221K sewing machine in this cute little green case! I've been wanting one to go with my black Featherweights (you can see them here) that I bought earlier this year at a farm auction (although I'll be selling one of them to help pay for my new white one). I haven't had time to clean it up or try it out yet, so I've just been admiring it on my dining room table today. I belong to two Facebook groups that have lots of information about Featherweights and vintage sewing machines: Vintage Sewing Machines and Singer Featherweight 221 & 222 Sewing Machines. I'll be using the information files in these groups to help guide me in servicing and cleaning my machine. Wish me luck! The many hours spent on a combine this last week had me a little stir crazy (or just crazy) and I began obsessing on Lori Holt's cute pincushions she makes from vintage ceramic animal planters. (You can see Lori's cute lamb pincushion here - 9th photo down & her cute pig pincushion here - the very last photo.) 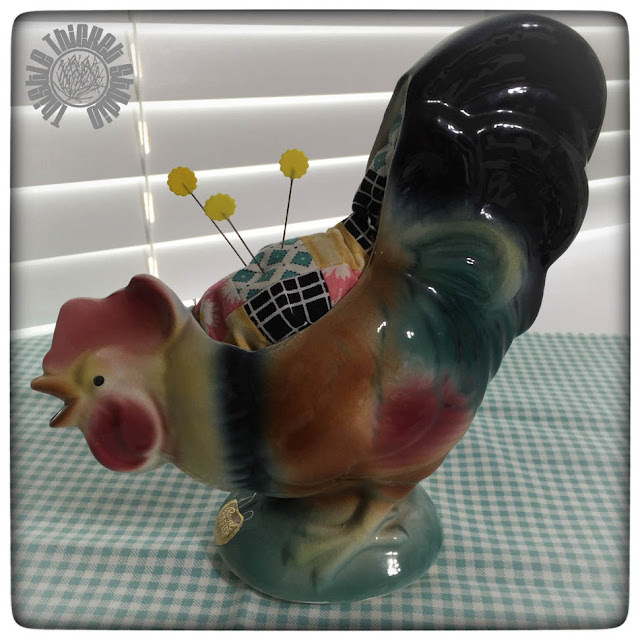 Hmmmm, I thought, tucked away on the bottom shelf of my china hutch is this rooster planter that was from my hubby's grandmother's chicken collection. I was thinking that rooster looked mighty lonely in that hutch, so the first thing I had to do after finishing harvest was to jack him up! It was really quite easy. I stuffed the planter with Fiberfil, made a little patchwork square and then tucked and hot glued the patchwork in the opening. I think he turned out cute and now graces my cutting table. I think I may have to collect a whole farm full of animal planters and make them into pincushions! 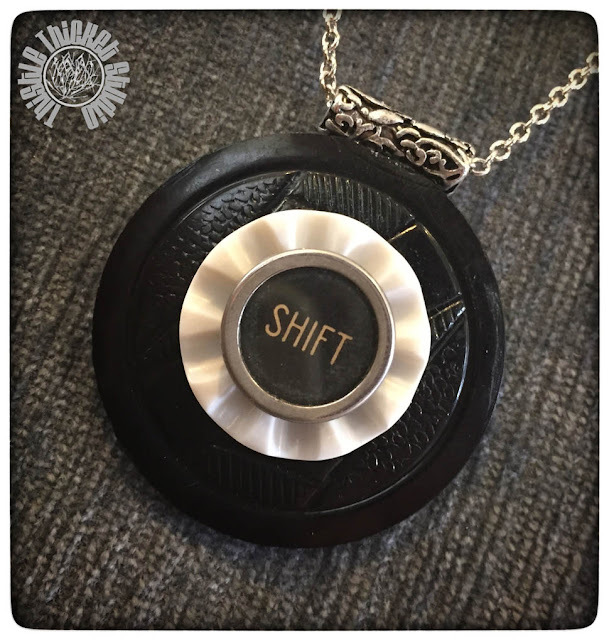 With harvest in full swing, I forgot to share a vintage button and typewriter key necklace that I made for my mom before she left on her Sibling Week. 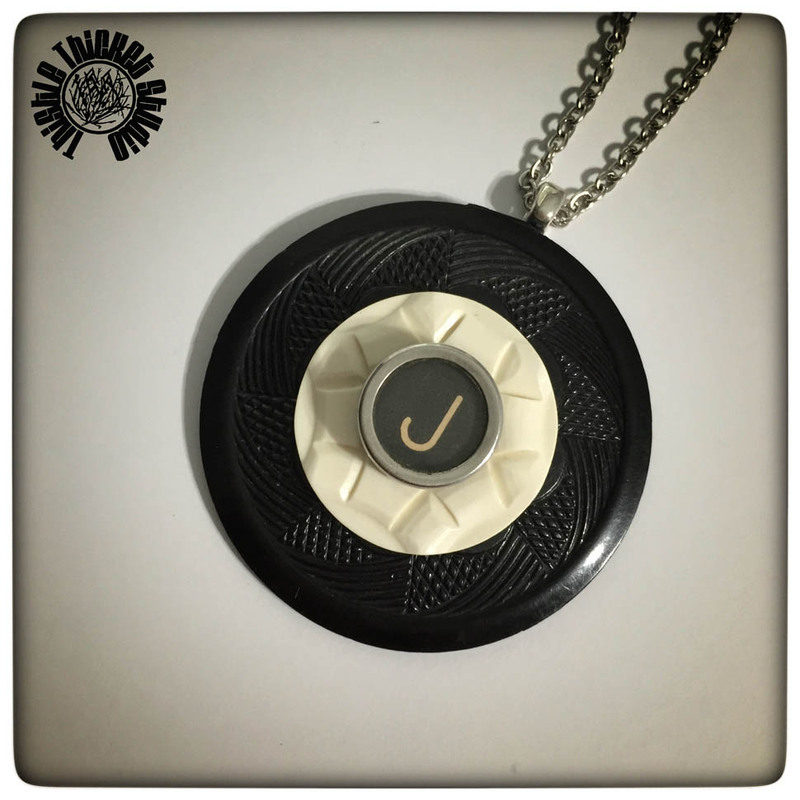 I'll be on the look out for more vintage black and white buttons that are just the right size to make more of these!